[New for 2011, now discontinued] You know, if some random person can create a holiday that no one can actually prove exists (i.e. today), then I hereby elect myself the Supreme Scooper Upper of said national holiday. As the SSU, I must pick a new product that best represents said holiday, and I know just the carton. I wandered down the aisle looking for some chocolate ice cream to celebrate National Chocolate Ice Cream Day, but to really celebrate, I figured it had to be something new. Lucky for me, Blue Bunny's Chocolate Lovers Triple Chocolate Cake premium ice cream was sitting there waiting for me. It says Chocolate Lovers, so how more fitting can it get? This is one of the four new flavors endorsed by Ace of Cakes star Duff Goldman. Now the cake pieces are kind of hiding, but boy oh boy do I have my eye on a certain frosting swirl staring me right at me. Let's see if we can dig out a few cake bits. Here they are, though I don't think they are meant to be washed in the sink. They are a good quarter inch thick and a decent overall size. Now I usually eat the samples after I do the penny test, and for the first time in a long time, I was shocked at just how fudgy these little buggers are. They're not too hard and somewhat gooey, and boy oh boy were they surprisingly chocolaty. The good news here is, they aren't even the best part of this treat. The frosting swirl isn't exactly easy to film, but I think we've got a decent example here. It's not super thick most of the time, but when you scoop yourself a bowl that is swirl - ice cream - swirl - ice cream - swirl, well, it's mighty good. Since it's technically frosting and not sauce, it's got a nice bit of frosting grit to itself. Add in that it has a somewhat unique taste (for a swirl) and what you get is something that blends really well with the ice cream. Having had so many ice creams, it's all about what sets a flavor apart nowadays, and this one does that. I was enamored that I was scraping my bowl because I didn't want it to end. My fear now is that every bowl won't be this good. Now let's step back for a second and re-exam the name Triple Chocolate Cake. We've got the chocolate base ice cream which is fairly standard Blue Bunny chocolate. We've also got the frosting swirl which works great with the base. Third is cake bits, but there is a part of me that says you don't need them. To be honest, my daughter didn't even eat all of her cake bits, though she did enjoy the ice cream as a whole. I'm not saying they are bad because they are way better than the ones in the Chocolate Fudge Brownie Breyers BLASTS, I just want to stress that the frosting is the star here. 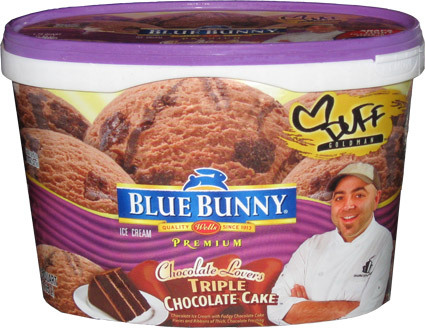 So, as ruler and emperor of National Ice Cream Holidays, I hereby declare Blue Bunny's Triple Chocolate Cake Ice Cream as the "official" ice cream of Chocolate Ice Cream Day 2011. On Second Scoop: I hate to say it, but I was wrong about this flavor. I didn't get home 'til after 7, it was way too hot for normal food, so I scooped myself a small bowl of this stuff and it was really good. In fact, I had a second small bowl to chase the first. Do you want to know what sold me on this flavor tonight? The cake bits. Oh the frosting swirl was working the room, but it felt like I was getting two cake bites in every scoop and it was really working for me. Nice job on this one Blue Bunny. On Third Scoop: It's been a few weeks now and I just finished off a bowl of this most excellent ice cream. The thing that got me excited this time? The wonderful layers of chocolate frosting. I didn't get many cake bits this time and I didn't care. Just keep laying that wondering frosting on my spoon. Mmmm, this looks so good..and im not normally a fan of chocolate ice cream! This stuff is so good I have avoided buying it again. It's one of those few ice creams I needed seconds of. This is the first of the Duff endorsed flavors that I've tried and I went with this one first bc you loved it. However, I didn't really like it! I love the swirl but the cake pieces didn't taste like cake to me - it tasted like brownies! Now I've never met a flavor of ice cream I didn't like but it just didn't do it for me..I can't wait to try the others and get back to ya! @danielle: how many times have you tried it? I found I had a different experiene every time. let us know what you think of the others. I held the highest expectations from this flavor out of all of the cake-flavored ice creams by Blue Bunny and yet this one was my least favorite and this is coming from some one who never used to enjoy fruit flavors in his ice cream. Sure, the chocolate icing and cake pieces are immersed generously throughout this ice cream but the chocolate ice cream base flavor robs the beauty of those mix-ins. A good ice cream product must have a great base ice cream regardless of the quantity or sizes of the mix-ins. If the ice cream does not have a good base flavor, then the mix-ins are pointless. This is the case for the Triple Chocolate Cake flavor. 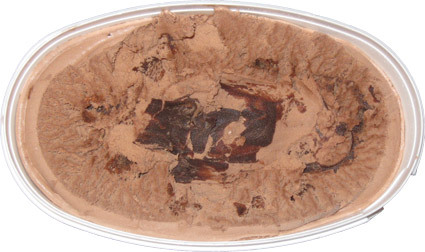 The chocolate ice cream began with an after-taste and ended with an after-taste. I have established a better chocolate flavor from the the combo of cocoa krispies and milk than with what Blue Bunny concoted here as chocolate ice cream. While the cake pieces delivered a nice texture and depth to this ice cream, the chocolate icing was too strong at times. I would even say that the ice cream would be best without its presence because it was overwhelming. Ben and Jerry's chocolate ice cream flavors all have a rich chocolate flavor that often trick me into thinking that I was licking the bowl of a brownie batter or a chocolate cake batter while eating their chocolate ice cream flavors due to the depth of their chocolate flavor. I was expecting the same for this flavor from Blue Bunny especially with the words of triple chocolate cake in the name of the product. Unfortunately, this product missed the mark for me. This seemed to me a chocolate lover's fantasy experiment gone completely wrong. I would like to see Duff redo this one with a chocolate cake batter for a unique twist and for originality.